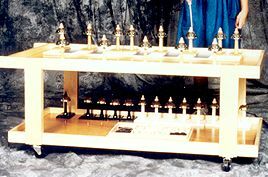 Every Montessori classroom needs a set of Montessori bells on a bell cart but unfortunately most programs are unable to afford a set for every classroom. In that case, it makes good sense to purchase a portable cart such as our bell cart that allows your school to share a set of bells between two classes. Perhaps one class has the bells on the even days and the second class has the bells on the odd. This way, both classes have this valuable piece of equipment to share. It has been stated that humans must tune their ears before they are age six years old or they risk being tone deaf. These perfect pitch Montessori bells are ideal for the children who are interested in music or have a need to tune their ears. We encourage you to invest in at least one set for your school.